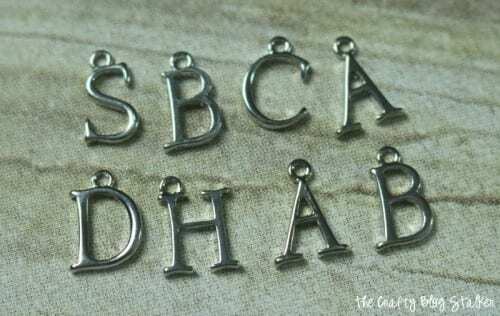 Learn how to make a beautiful monogram necklace. An Easy DIY Craft Tutorial Idea. 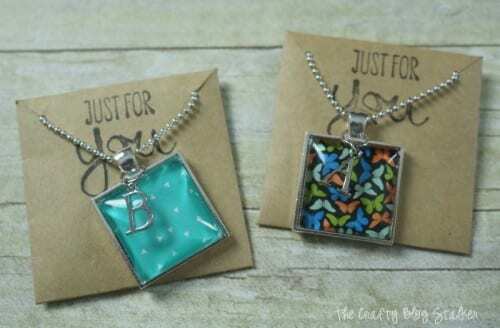 Charm necklaces make a great personalized gift. 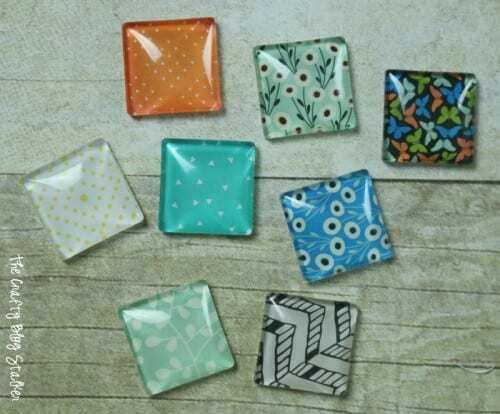 Great for teacher gifts! I would like to start by saying this is not a sponsored post. 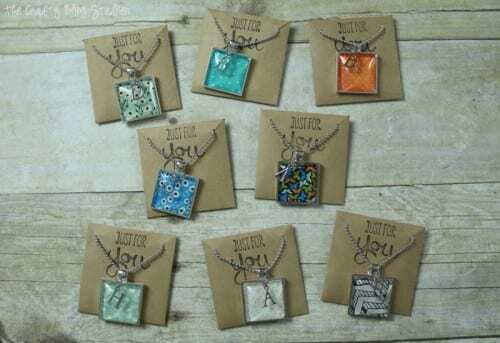 I am showing you how to make these necklaces because I love giving personalized jewelry as gifts, and I love the product. For my day job, I work at Stampin’ Up!. At the end of July, they hold their annual convention for all of their demonstrators. This event is something that my team works long and hard on to make sure that it is a successful event. There are 10 people on my team including myself. It is kind of a tradition to give a little gift to everyone when the event rolls around. I was very excited about my gift this year and really hoped that everyone would love their monogram necklace. Most of the necklace components came from craftfantastic.com, and these kits are great for making your own jewelry. They make the process super simple, and the kits aren’t too expensive either. The kit comes with a glue that you put on the back of the glass piece and then stick to the paper. Let the glue dry for a couple of hours and then trim the paper around the square glass piece. The next step is where the monogram comes in. 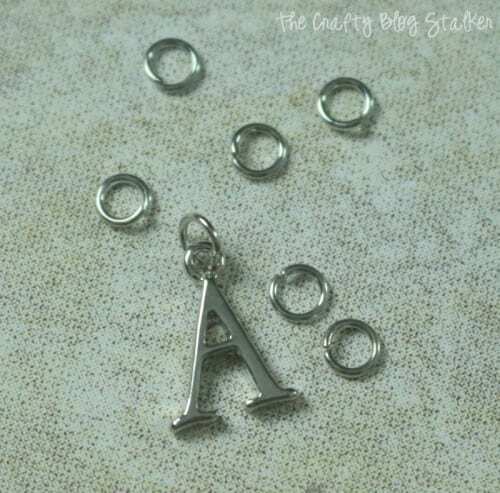 I found these perfect silver alphabet charms. 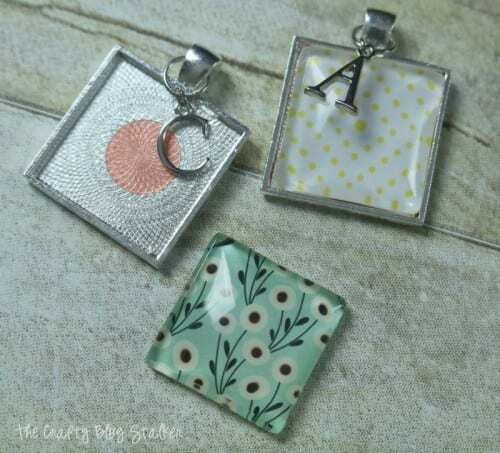 Add a silver jump ring to each letter and then attach to the base of the square pendant. 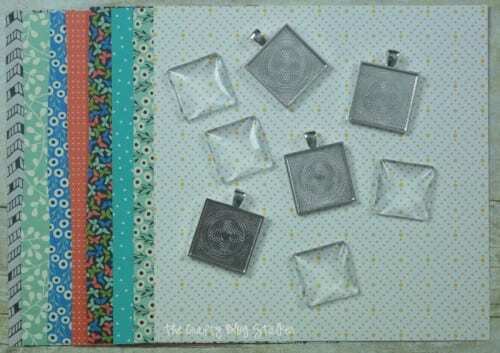 Apply a super sticky dot in the center of the silver metal pendant, peel off the red backing and stick down the patterned paper glass square, and that is really all there is to it. Of course, we need a cute way to package them! 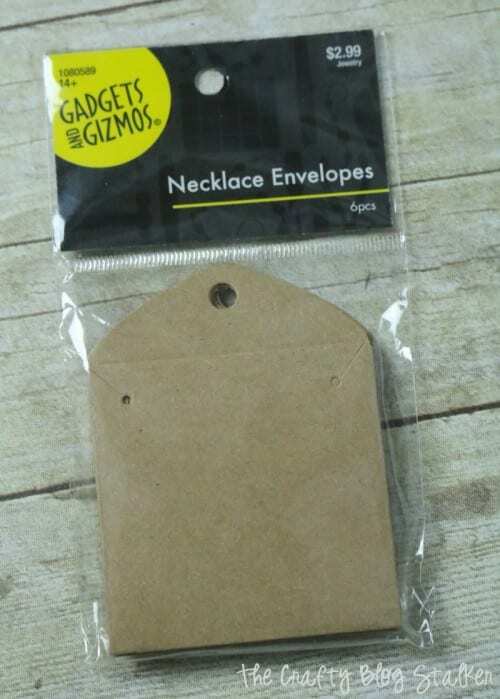 At the craft store, I also picked up these necklace envelopes. But I couldn’t leave them plain! So I added some fun stamping to the front of them. 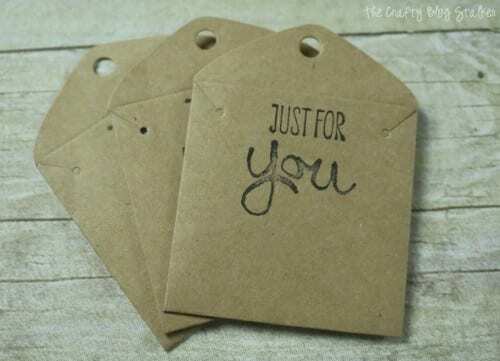 String the monogram charms onto the 30″ fine ball chain and put them in their packaging. Here are all 8! I didn’t make myself one (although I’m wishing I did), and the other person on our team is a guy, and I didn’t think he would appreciate it, so he got a big bag of candy instead. 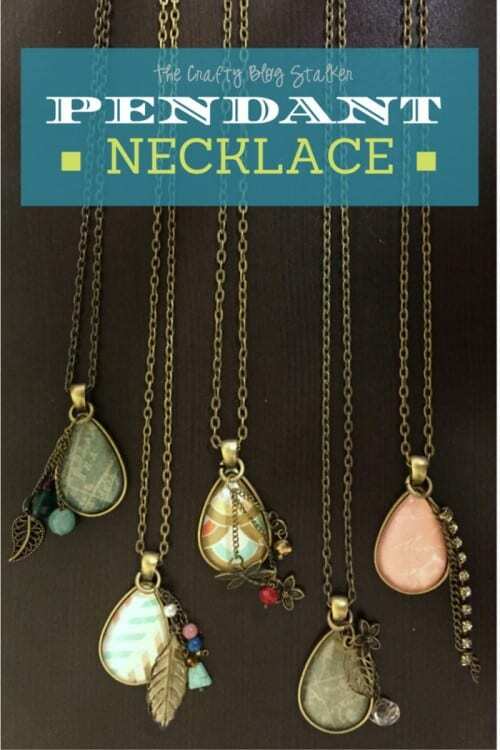 If you like these necklaces you should check out the DIY Jewelry Pendant Necklaces that I recently made. 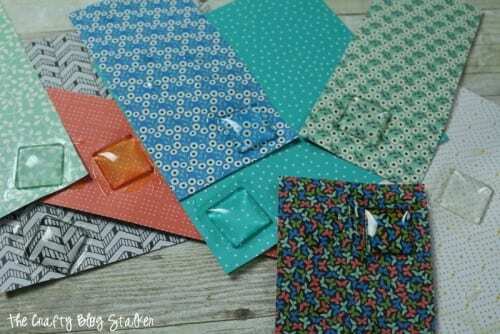 I also have a tutorial on How to Make a Necklace Envelope if you want to make everything for your gift. 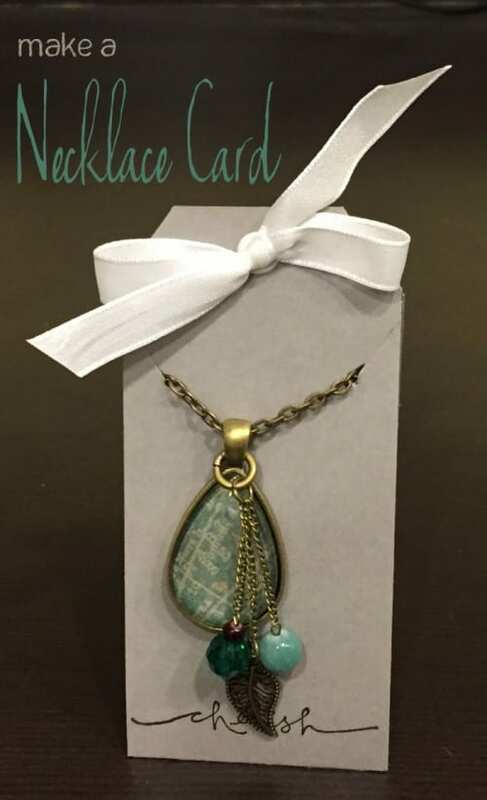 Have you ever made jewelry as a gift before? Share and leave a comment below! SAVE HOW TO MAKE A MONOGRAM NECKLACE TO YOUR FAVORITE PINTEREST BOARD! These are so fun! They would make an awesome gift! Such a pretty necklace! Thanks for sharing your crafty inspiration on this week’s Monday Funday Party! I have ALWAYS loved DIY projects! These are fantastic! Thanks for sharing. This is really wonderful! Thank you for sharing with us at Brag About It! I am totally pinning this idea for Christmas presents this year! I love these so much! I’m visiting from the Best of the Blogosphere LInk up! Thanks Jennifer! Monogram necklaces do make excellent gifts! These are really cute! Thanks for linking up to Merry Monday! Sharing on G+! Have a great week! Very neat, personalized gifts indeed! Thank you Brandi! It is a fun little craft!